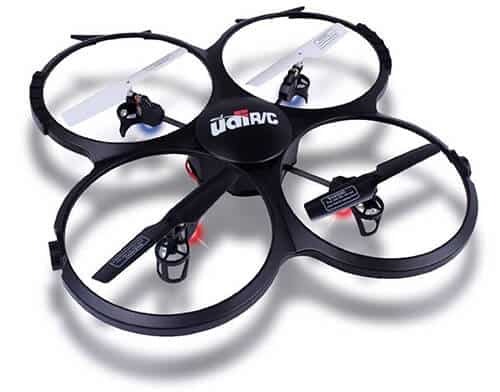 Radio controlled quadcopters are a fun and exciting hobby for the entire family. The Syma brand makes a wide range of flying drones to suit all levels. TheSyma X5C Explorer is a quadcopter that is perfect for the beginner. It has elastic blade guards that bounce back, and can take that abuse that the beginner may inadvertently cause. The Syma X5C Explorer is a full-size quadcopter, so you’ll still be seen on a playing field filled with other drones. Best Quadcopter Under $100 – Syma X5C in the list! 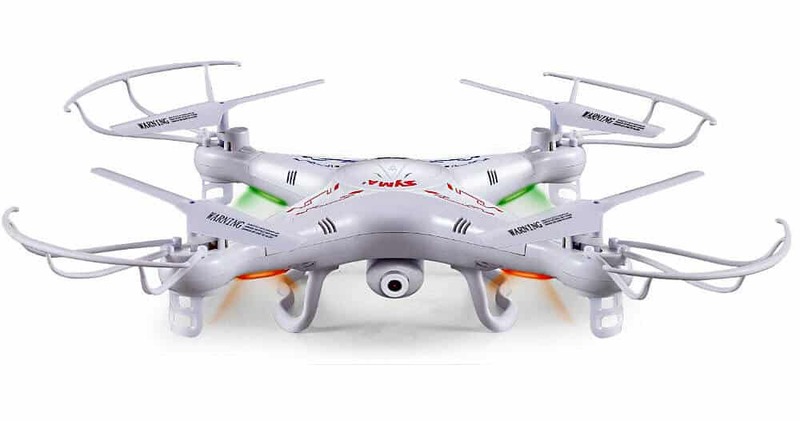 The Syma X5C Explorer is a quadcopter in a smooth white finish with four protective blade guards. It comes with a high definition camera, and has yellow and green running lights, so you can spot it at a distance. It’s built to be easy to fly, so you can have more fun, instead of trying to learn how to keep it in the air. The Syma X5C Explorer is packed full of features to interest the beginning or the seasoned drone flyer. The Syma X5C Explorer is built with a six axis gyro, a direction stabilizer, to help keep the quadcopter stable, and not wobbly in the air. It has a 3D lock to keep from needing constant adjustment. This allows you to have more scheduled flight time in air, and less down time on the ground. You’ll be able to do cool tricks with your Syma X5C Explorer. It’s capable of doing a 360 degree eversion. You can watch as it does a key 360 degree roll above the air, then returns back to original position again. Or, try a series of rolls. Doing tricks is easier on the controls now. During flights or landings, the four blades on a quadcopter can suffer damage, as they hit trees, the ground, or other objects. The Syma X5C Explorer comes with four blade guards, to keep your blades safe. These blade guards are white, and made from a highly elastic protective material, that is shaped in a circle. If the quadcopter hits something, it’ll just bounce right off again. Your worries are decreased that you’ll damage your drone. You’ll also not have to worry so much about grass or fibers getting wrapped around the blades, which can cause a lot of frustrating down time in other drones, as these fibers need to be removed. The pure white color of your Syma X5C Explorer should enable you to spot it easily in the air from a distance, but it is also equipped with two green lights, and two yellow lights on its underside. These colorful running lights will enable you to keep an eye on your drone, while it’s flying through the air. It’s also perfect for flying at night, even when it’s pitch black outside. You’ll be better able to spot your drone through the air. The LED running lights make drone flying at night an option, and the fun won’t have to stop, just because it got dark out. Many quadcopters don’t come equipped with a camera, but the Syma X5C Explorer has an HD—High Definition—video camera onboard. This camera is safely tucked under the body of the Syma. It’s protected by the body of the quadcopter, and the two supportive structures on either side. You’ll have a ton of fun taking pictures and video of the great scenery, while your Syma soars through the air. The radio controller is black, with a carry handle, and an antenna at the top of the unit. It runs at 2.4 Ghz. It has a small LCD display screen. You can use the RC to control your drone up to a distance of 30 meters. The radio controller is packed full of features to control your drone in the air. There is a high and low speed switch, so you can control the speed of your flight. There are the standard left and right control levers, and switches for left and sidewards fine tuning, and forwarding and backward trimming. The power on off switch is located in the middle. There is also a mode switch under the levers for left and sideward fine tuning, and for photo and video functions. To do tricks, the 3D eversion switch is on the top right. The radio controller utilizes spread spectrum technology to get your drone further away from you. It has the best anti-interference, and with a minimum of power consumption. Its reaction speed is 100 times that of other radio controllers. You’ll won’t have to worry about your Syma X5C Explorer being confused by other radio controllers on the field. You’ll stay in control of your drone at all times. It’s easy to charge up your Syma X5C Explorer. It works with a USB charging cable, that charges up an internal 3.7V 500 Mah Li-poly battery. Inside the Syma is an alignment port connection. It takes about 100 minutes to charge up the drone. Once fully charged, you’ll have about seven minutes of flying time, before needing to charge up again. The Syma X5C Explorer measures 31 centimeters by 31 centimeters. Its height is 8 centimeters high. Inside the box you’ll get one Syma X5C Explorer quadcopter, a screwdriver, four main blades, one radio controlled remote control, operating instructions, and the AC adaptor and charge box. You’ll need to add your own batteries for the radio control unit, but the drone is rechargeable. Best Quadcopter Under $200 – and winner is … Syma X5C! The Syma X5C Explorer quadcopter will interest both the beginner and the professional. It’s perfect for the beginner to learn on, with it’s blade guards and gyro system to keep flight stable in the air, but is capable of being controlled manually, so even a flying professional can find entertainment value in flying. It’s packed full of features such as the 360 degree eversion, and a fully featured radio controller. The addition of the video camera makes the Syma X5C Explorer a truly entertaining flying experience. Next-Gen VR Headsets Coming Soon That We Cant Wait To See!